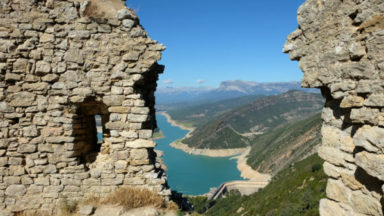 Cicerone‘s Publisher, Jonathan Williams, reports from a recent trek – 10 days across Aragon on part of the 1250km of Spain’s Sendero Histórico, the GR1, which charts a remote but accessible path across northern Spain in the foothills of the Pyrenees from Galicia to the Mediterranean, along the ancient Muslim–Christian line of control. 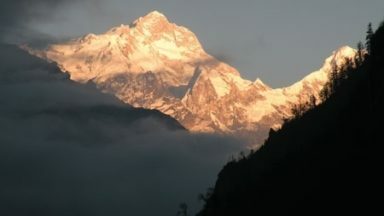 There's also a video to watch, with highlights from the trek. ‘Aragon, isn’t that where Catherine was from?‘, ‘Where on earth is Aragon?’... The questions came from all sides as we announced that the GR1 through Aragon would be our spring trek. John Hayes had persuaded me that this 1250km route was ‘the best in Spain’ and we felt duty-bound to check it out. We quickly concluded that we could only manage to squeeze in ten of the 53 stages described in John’s itinerary for the route. 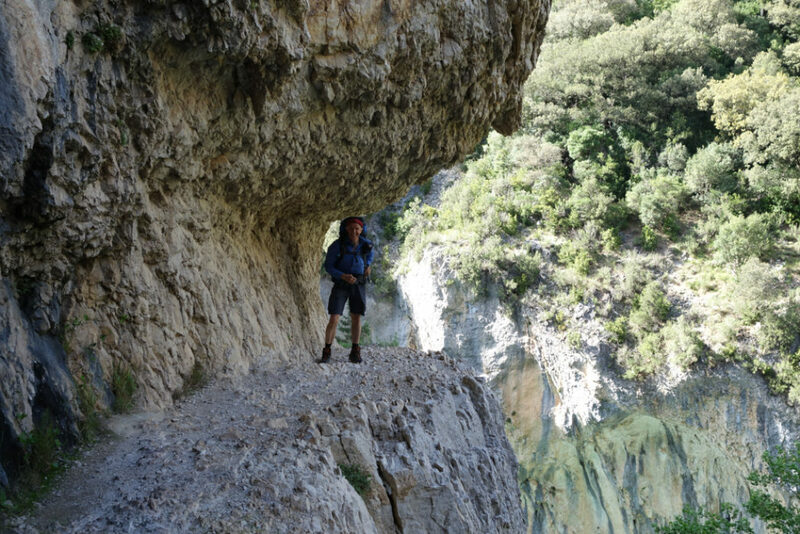 We talked it over with John and concluded that the section in Aragon starting around Murillo de Gallegos and Riglos and finishing a couple of hundred kilometres to the east was both accessible and great walking, running just south of the Pyrenees and likely to provide big views to the north. 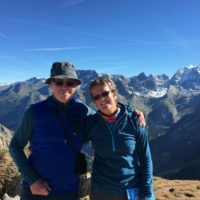 A successful trek requires the right route and also the right company, and this one was perfect for our friends Clive and Lucy – long stages that Clive loves being the main feature of the route. Companions gathered and armed with John’s draft manuscript, a few dodgy maps, a mobile phone, a GPS file and, frankly, rather limited Spanish, we were off. Barcelona was the entry point (and stop-over on the way back) although a flight to Zaragoza would have got us closer, but Stansted is in no way convenient for us, living as we do in Cumbria, so instead we decided to give Spain’s new fast trains a go. And fast and smooth they were, on brand new tracks, and we watched the carriage speedo gradually climb to 350km per hour as we were whisked from Barcelona to Lleida in little over an hour and then took a taxi to our start point at Riglos. 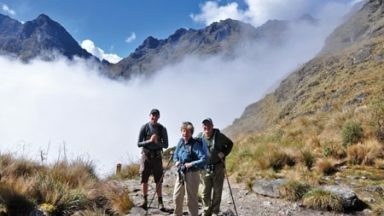 Accommodation on the trek is a combination of small hotels and B&Bs, sometimes in accommodation best suited for walkers’ or climbers’ in the rather limited number of holiday spots in this remote region. We had good places at every location. The main challenge was persuading local restaurants that we needed to eat early, not Spanish-style where the evening meal can start any time after 10pm. We only fell foul of this once and then got the hang of explaining our need for an early meal and an early start... and, of course, a bocadillo – a large sandwich comprising a large chunk of bread wrapped loosely around a sizeable chunk of meat. Just about perfect for a long trekking day (If you’re a meat eater! – Ed). Riglos is a big centre for climbing, with a series of 300m+ high red near-vertical sandstone monoliths. Climbers were discussing their exploits in a local bar as we left but it was already lunchtime and our first few hours’ trekking were calling us away from civilisation and out under the vast cliffs and into the hills. Bolea was a touch non-descript, but the accommodation was good. This was where we got caught with the late meal, sitting there with our tongues drooping and stomachs rumbling, hanging on for nourishment. In the morning, we found the paneterria was only open in the afternoons and so had to beg a couple of loaves for the day from a café. In the stages after this – to Arguis, Nocita and then Rodellar and beyond – we got to know one of the unique features of the Aragon countryside. The villages have been abandoned over the post-war period and the remnants, decaying and a little spooky, house only the occasional family and sometimes no one at all. 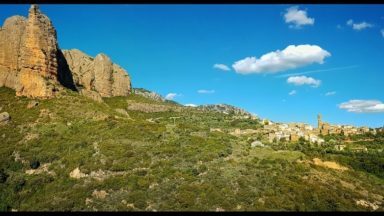 Two centuries of urbanisation and industrialisation in Britain was compressed into two generations in Spain, and these remote communities didn’t survive the experience. Luckily for us their tracks did, and now made up our Sendero Historico. 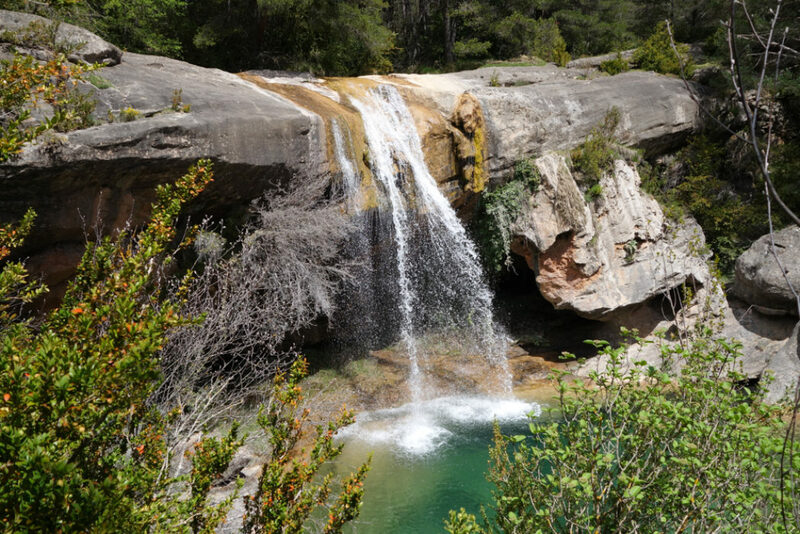 It was on the trail to Arguis on the third day that we got our first big views north to the Pyrenees, just south of the Ordesa Canyon and Monte Period area. The peaks were still in winter, with snow down to around 2200m, but the views of some 400km of the Pyrenees were impressive and inviting. 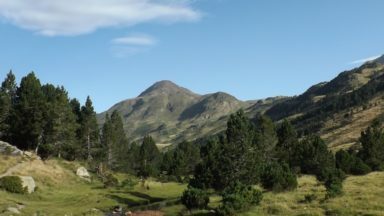 The GR11 which goes through the mountains on this Spanish side immediately hit our to-do list. Geologically the whole area is a bit of a cement mixer. Africa is pushing Spain north and this area just south of the Pyrenees is where all that pressure comes out. 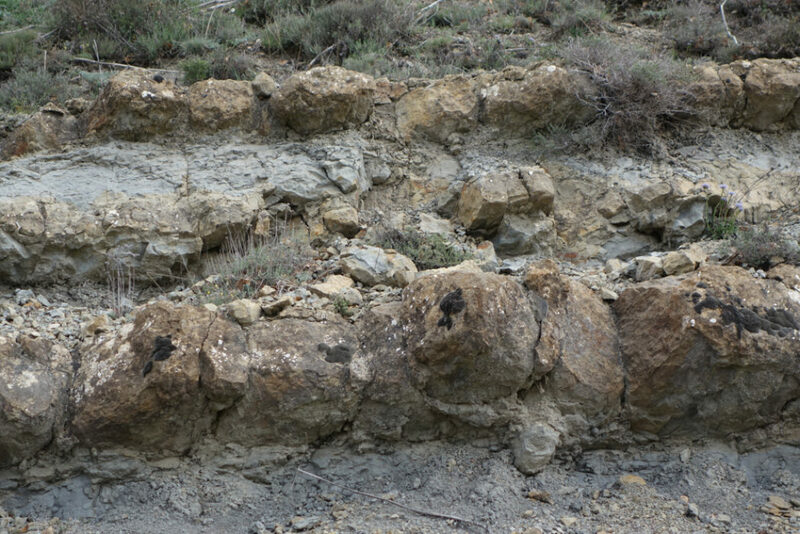 Canyons, conglomerate, fault lines are all part of the mix here, churned out by pressure and water. At around this point we finally walked onto the map – well, onto Alpina’s Sierra de Guara map, probably the only high-quality map covering the route until it reaches Catalonia. 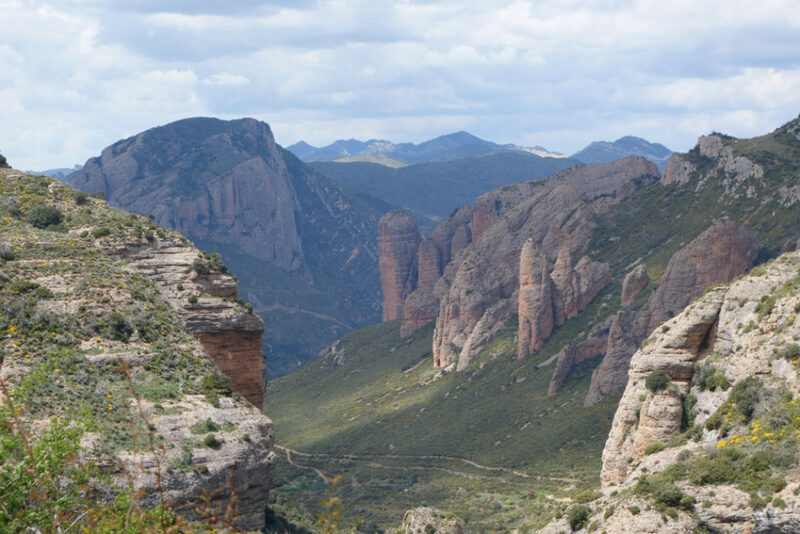 The Guara has higher mountains and deep canyons, particularly the ones around Rodellar, which is another major climbing centre and also a centre for canyoning and offers a wider range of accommodation. We stayed in a climbers’ camp, in an isolated renovated barn with spectacular views down into the canyons. Having detoured a little from the main GR1 route to get to Rodellar, we decided to take a so-called rest day here, to explore the ridges and canyons around the area. There’s probably a good week’s day walking here, and it would make a fine base, with a day or two of careering down canyons and some fine climbing, too, if that’s your thing. Then, ‘rest day’ over, it was back to the 30km days! To this point the weather had been mixed, a few showers, a bit cloudy, a bit windy. But from Rodellar on, the weather was just wonderful, with highs of around 20º and full sunshine. The trail is certainly waymarked, but in the distinctive manner of Spanish GR routes – a unique form of sign language that benefits from careful translation. Otherwise we were using the Spanish IGN (or military) maps which to those used to French, Swiss or British maps are initially rather hard to parse but you do get used to them. Although I had complete printouts (one of the perks of being a publisher but they are now downloadable) the best format was online, with a GPS track imported to show the route (otherwise unmarked on maps). So I finally came to appreciate navigating on my phone because here was no choice. (Open Cycle Map formats have since proved useful as well.) On the upside, we might not have been able to do the route without it and it saved a lot of weight, as well as telling us where we were when we weren’t sure. On the downside, you have to walk with your phone in your pocket and spend a lot of time peering at it. The commonly cited problems of batteries, signal, rain didn’t really apply for us. A waterproof phone holder in a waterproof bag was fine; batteries lasted a couple of days and charge facilities were available at every stop; and the GPS signal came through the phone signal not the data (turned off) so it didn’t run up big bills. It even worked when the phone had no signal. After Rodellar we ran into a succession of long days, all over 30km and 9 hours of walking but we took it all in our stride. 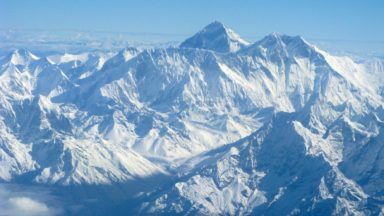 The only really challenges were navigational – discrepancies between the GPS track and the route on the ground. To my surprise, we tended to believe the GPS more than our instincts and that prejudice let us astray more than anything else. One day was 38km and very special. After a long morning we arrived mid-afternoon at a fabulous holiday resort constructed by a trades union along the side of one of the immense reservoirs that are used to capture the waters in the mountains for the lowland – the Embalse de El Grado I. Professor Higgins (‘the rain in Spain falls mainly on the plain’) had a better grasp of rhythm and speech therapy than climatology. After refreshments at the bar – we were the only people around except the bartender and his girlfriend – it was onwards up-river into a deep gorge (L’Entremon). The path clung to the side of the gorge about half way up, with spectacular views both up and down, before emerging along another lake (Embalse de Mediano) and then over a col and down to El Humo de Moro just before 8pm. The hills over the last couple of our days were a little rounder, more wooded and on occasion the trail sought out the deepest woods leading to a certain amount of thrashing around and trying not to ping branches into the eyes of the person walking behind. 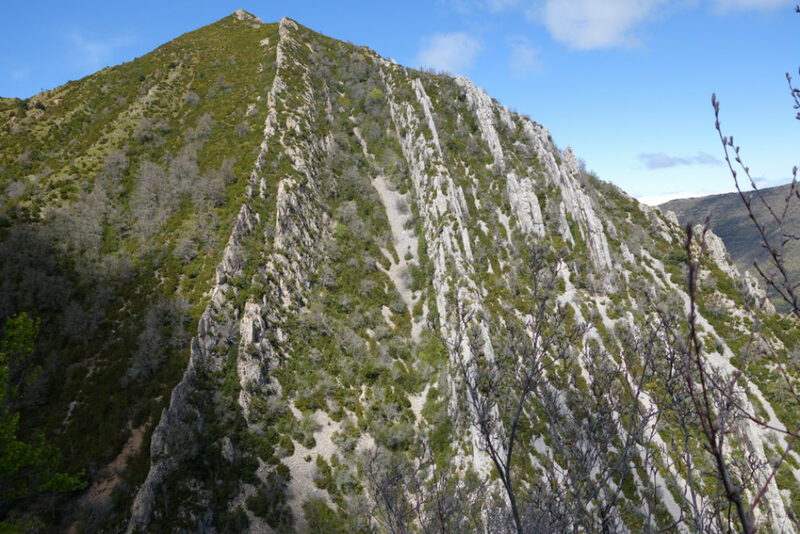 But the last day rewarded us with a fine, 10km-long broad ridge with views north to the mountains and south to the flat lands before the descent into Graus. 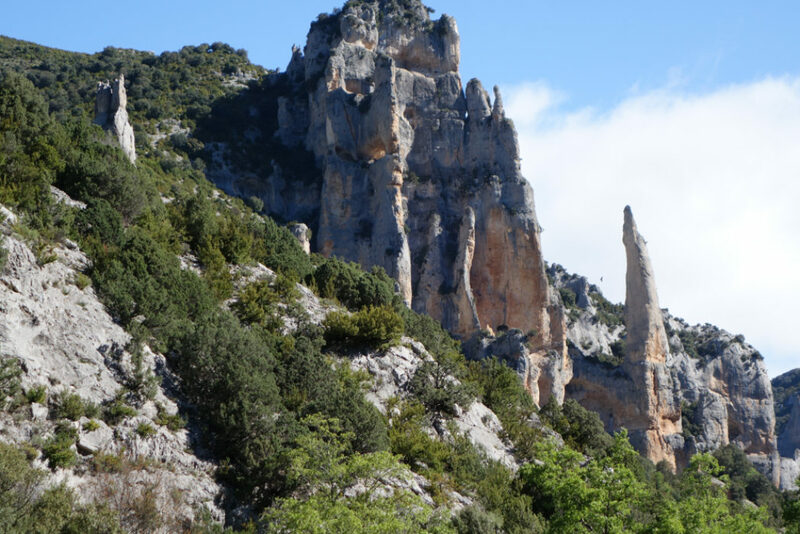 Cicerone author John Hayes makes this section of the GR1 (included Section 5 in his guidebook, Riglos to Graus) 188km, 7400m of ascent and 9 days but we digressed from the route to explore. Catherine was born near Madrid. Aragon included Barcelona and Catalonia in those days and she was the daughter of Ferdinand and Isabella who completed the reunification of Spain (and funded a certain Christopher Columbus). She was the first female ambassador in European history. Well educated she could hold her own in argument with Erasmus and Thomas Moore. She headed up the English government at the time of the Battle of Flodden against the Scots – while good old Henry was partying in France – and she was related to the old Plantagenet English royal family through John of Gaunt. (Little-known fact: John of Gaunt invaded Spain in the 14th century.) She sounds quite a lass.